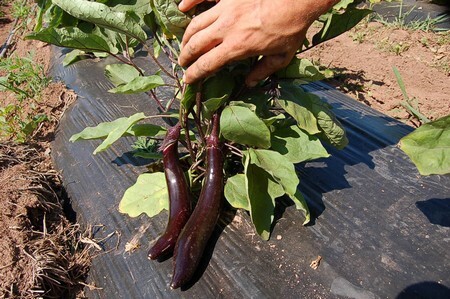 Although we now know them by their French name, aubergines were originally called eggplants – look at the small white fruits of the variety ‘Ova’ to see why. It is not easy to grow them in the British climate, but you are more likely to succeed if you live in southern Britain, or if you have a greenhouse or polythene tunnel. In high summer, the plants can stand on a patio where the attractive leaves and flowers can be appreciated. Garden centres are likely to stock a few conventional varieties, but look to the specialist vegetable catalogues for a huge choice of exotic types – purple, green, white and striped oval, round and sausage shaped. ‘Moneymaker’ is the best variety if you want big purple fruits like those in the supermarket. In the Gardening Which? trial, it produced seven fruit per plant. ‘Long Tom’ and ‘Vista’ are other standard purple varieties. ‘Ova’ is well-named because the white fruits are about the size of a hen’s egg. The crop may not be huge, but makes an interesting talking point on a patio. ‘Slim Jim’ produces bunches of finger-sized fruits, like miniature versions of the typical supermarket variety. The purple-tinged foliage is attractive enough to justify its position on a sunny patio. ‘Violetti di Firenze’ is one of a growing number of exotic varieties finding their way into the specialist catalogues. Although low-yielding, it has spiny leaf stalks and purple-and-white striped fruits. Sow two seeds per 9-cm pot. The seed is similar to tomato seed. You will need a heated propagator or at least a warm windowsill, where you can maintain a constant temperature of 20°C. Gradually wean the seedlings, reducing the temperature to a minimum of 14°C at night. If both seeds germinate, remove the weaker ones. If you have not raised plants from seed, buy small plants from a garden centre and pot into larger pots. As the plants begin to fill their small pots, pot them on into 2-litre pots of multipurpose or growing bag compost. Pot the plants on into 5-litre pots. This size pot should be sufficient to produce neat, manageable plants. When the plants reach about 20cm high, pinch out the growing tip to encourage them to branch. Vigorous varieties may require further pinching to keep them bushy. This method worked well in a Gardening Which? trial. Aubergines can also be planted directly into a greenhouse border or growing bags and trained as cordons in the same way as cordon tomatoes. Remove the first flower that forms to encourage further flowers – and fruits. Use split canes to support the main stem and each main branch, before the fruit starts to swell. During this period, you may need to water the plants twice a day on hot days. After the first flowers start to form, feed regularly with a tomato fertilizer, according to the manufacturer’s instructions. It is also worth moving the plants out of a greenhouse to a sunny position outside. Aubergines are very sensitive to frost. If the fruits are still developing, move outdoor plants under cover at night. Pick fruits when they reach full size and have developed their rich purple color.